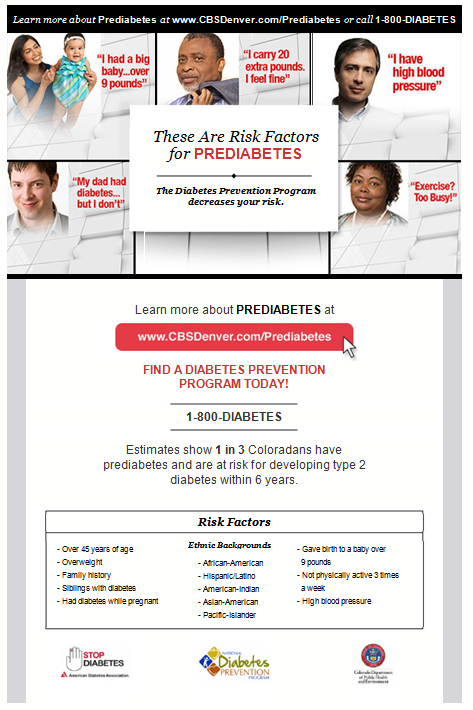 An email blast campaign highlighting the risk factors for prediabetes was launched March 26 by CBS media. This email outreach exposed thousands of consumers to vital prediabetes education information and resources. Readers were encouraged to access a dedicated, CBS prediabetes webpage to learn more about their risk of developing type 2 diabetes. This webpage is also available in Spanish. The email blast is part of a multifaceted prediabetes campaign aimed at raising awareness of the Diabetes Prevention Program, a healthy lifestyle program designed to keep people with prediabetes from developing type 2 diabetes. The campaign features Spanish language radio spots on KJMN and KXPK,and television advertisements on CBS and Univision local broadcast stations. The media outreach also includes various outdoor posters, bus bench and shelter ad placements in the Denver Metro area. The CBS prediabetes awareness campaign was relaunched in early March and will continue its run through May.